mix well before adding the milk to make a soft dropping consistency. cake with a skewer, if it comes out clean, the cake is ready. Cool in the pan. cake, using a fork to make patterns. To see what my fellow bloggers from group D cooked up this month, click on the smily frog below. To see who got my blog and the recipe chosen (it’s delicious!) click here for Avril’s site. The Secret Recipe Club will take a break in the month of December, but we’ll be back in full swing next year! Karen, it was great to spend time stalking your blog! What a stunning cake, perfect for the holiday season. Oh my goodness does that ever look delicious! 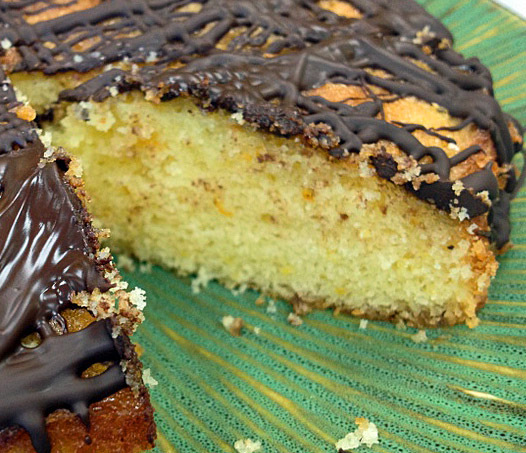 Orange and chocolate go so well together and that drizzle is just beautiful! Orange and chocolate is a winner combo! This looks DIVINE! Great SRC pick! I love the simplicity of this cake – and the wonderful flavors. Delicious! Oh my, just the thought of combining chocolate and orange together makes my mouth water. I can imagine how delicious this cake was. Makes me think of a candied orange peel covered in chocolate…. what a dream! Chocolate and orange are perfect companions. I think this must be dessert tonight! Great SRC pick. I would love to have a slice tonight… unfortunately I would have to bake another cake, this one is history! Yours turned out beautifully! Chocolate and orange is such a good flavor combinations 🙂 Happy reveal day! Happy Reveal Day for you too! THanks for stopping by…. Gorgeous Sally! I love fresh orange cake and yours turned out so well. I actually think the drizzle is what makes it so seductive. That first photo has a wonderful warmth – the orange is aglow under the drizzle – it reminds me of flames poking through wood. Beautiful and captivating. A cup of coffee and piece of your cake and I’d be swooning! 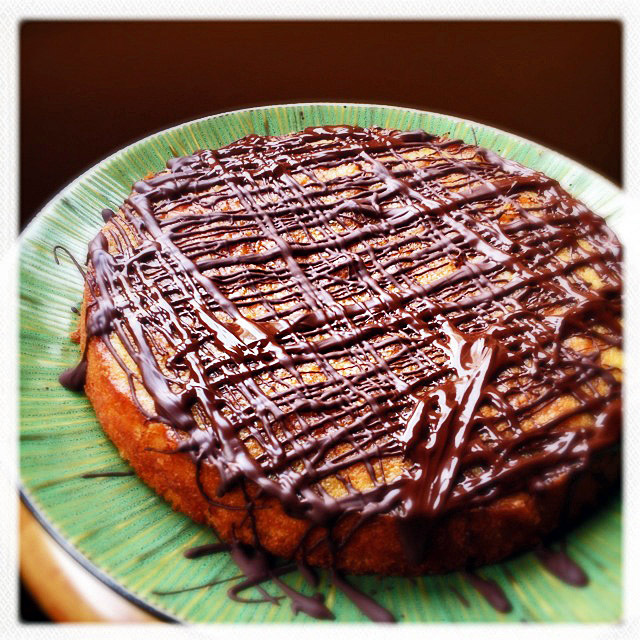 Yeah, coffee and orange cake with chocolate… hummmmm…. What recipe did the person assigned your blog make? My nemesis comes when I add the eggs, curdle on baby! But that looks fabulous and I might have to make for Brian who always says the word chocolate when I say the word orange, with a little tremble of his lower lip, and I say no, aniseed, or some such and he sighs a little, his head lowers and he goes off to read about steam trains or something…. so I think I’d better make this one TODAY!!!! Thanks for the inspiration and of course to Karen too ! Oh, that was too good! The tremle of the lower lip…. priceless!!!!!! You made an awesome choice with that cake!! Chocolate and orange make for such a great flavor combination! I could not resist, the moment I saw that cake I knew I was going to love it! wow this looks amazing!! I love drizzle cakes and you’ve done a brilliant job with this. This cake looks fantastic! Love the drizzle on top! Love the combo of chocolate and orange…Great SRC pick! You did a great job! You are becoming a wonderful cake maker. Don’t worry, I won’t tell your secret! Wow! that is one beautiful cake! The drizzle definitely makes this cake special, but the orange zest permeating the cake is to die for! Oh gosh – orange and chocolate…two of my favorites in combination! I just heard about the Secret Recipe Club and have submitted a request to join…hope I get in! THAT IS AWESOME! I hope you get in soon, there’s a waiting line that gets bigger and bigger, but it’s worth waiting for, such a fun event. That would be fun! I see they take a break in December so I’m hoping I’ll get in early next year! I’ll try to remember you are in group D. Happy Saturday!